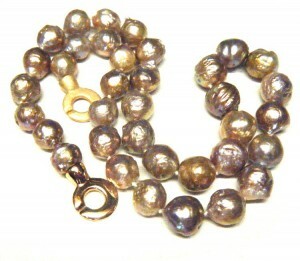 I’ve had several enquiries recently about sustainable pearls and/or ethical pearls. (the terms seem to be used interchangeably). The standard pearl industry answer is that it is impossible to supply sustainable pearls or ethical pearls because pearls from many sources get mixed together indistinguishably in their journey between farm and wearer. Most pearl farms are sustainable and ethical because they are often staffed by family, or with a small local staff which helps the local economy and in any case pearl farms have to be environmentally pretty sound because all molluscs are ready to die off at the least excuse – too hot, too cold, too salty, too brackish, too freshwater (sea pearl farms can be wiped out by a series of thunderstorms inland diluting the saline environment near a delta for example). They are all like Goldilocks, everything must be just right. Then they can reject the graft, get infected, get choked by weeds so they starve. 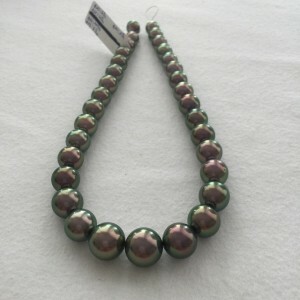 But most pearls on sale travel from farm to pearl factory to wholesaler to importer to local wholesaler to retailer. At Pearlescence we cut out a couple of those stages as we usually buy pearls which travel farm to factory to wholesaler to us. 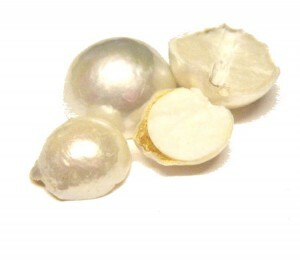 For most sea pearls – gold, blue and white south seas, Tahitian and Akoya this is true, and for all freshwater pearls. But, on the plane on the way to Hong Kong I had plenty of time to think (oh how I wish Hong Kong was a bit nearer!) and realised that I know enough sea pearl farmers and farms individually to cover most types of salt water pearls (yes to Tahitian, Sea of Cortez and Vietnamese Akoya) . 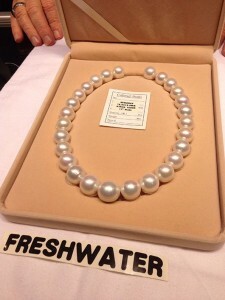 Freshwater pearls were going to be the problem, simply because they invariably go from farm to pearl factory where the harvests from many farms is mixed, graded, blended, treated and turned into wholesale-ready product. As the flight progressed I remembered that I know one family with its own small factory. 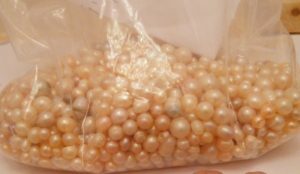 The result was that before I left a 1 kilo scoop of pearls had been taken from a lot of pearls as they came into the factory, before any treatment, mixing, sorting or anything was done to them. Nothing done except a quick wash. The more I look at them the more fascinating this snapshot of the production from one Chinese pearl farm is. The colour is predominantly a pale peach, with degrees up to pretty orange. Most of the pearls are elliptical or potato, with lots of buttons too. Sizes range from a couple of mm to about 12mm with around 7mm to 8mm being the average. Most pearls have a decent surface, although some have rings. But it is the quality of the lustre which is most intriguing. Most of the lustre is around A+ or AA. 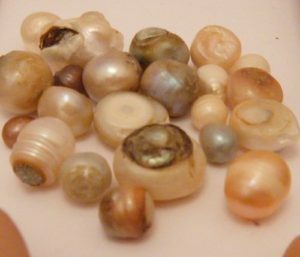 There are quite a few pearls with no lustre at all, completely flat and dull,while maybe a hundred have enough lustre and colour for me to buy them. There’s even a single white tiny rosebud/granulated pearl! 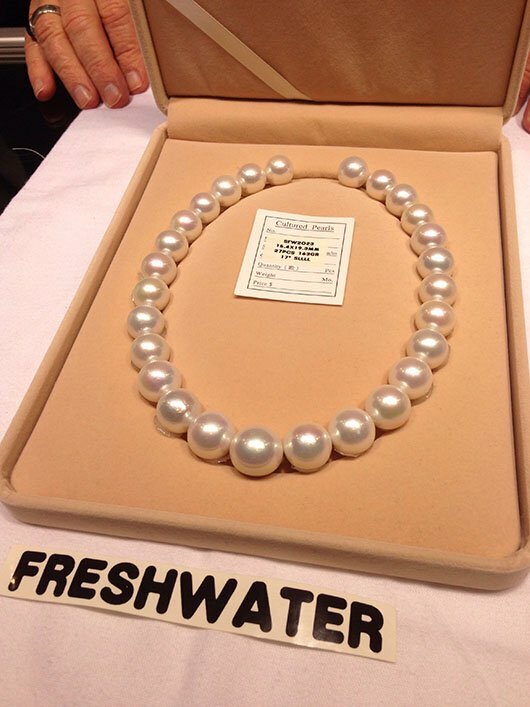 The bad pearls really are dire – as the photo shows. Some of them look like teeth which have been left to the mercy of a really incompetent dentist, who has made merry with old fashioned amalgam, which others are completely without any lustre, just chalk. There’s one of these which is nearly all completely dull but with an intensely metallic tip. Anyway, we are going to attempt a few pairings and see if we can make some single farm source stud and dangle earrings out of the better pearls. What this experiment shows mostly is that pearl factories work; the good quality pearls which Pearlescence offers really are the top 0.5% (or less) of any general pearl harvest, and that you can find single farm sustainable pearls if you have the contacts! 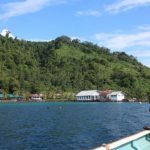 This entry was posted in Pearlescencery and tagged ethical pearls, freshwater pearls, pearls from one farm, sea pearls, single farm pearls, sustainable pearls on October 19, 2016 by WendyG.